CLICKER is a robot design for automated mouse clicking and keyboard writing. Clicker program, mouse program, keyboard program, mouse click program, keyboard app. ALL IN ONE. Auto clicker software, clicker software. CLICKER is the most advanced mouse and keyboard app, automate program. CLICKER has many features and require only Microsoft Windows OS with .Net Framework 2 installed. With this app You can call a different mouse click, write text, open the website (url), restart or turn off the pc - all at the specified time. Its fully programmable. Just create a list of commands and invoke them in multiple cycles. You can remote mouse and keyboard keys, manage windows state and run processes at specific time. This mouse program and keyboard program help You automate your work. Auto Mouse Clicker is a tool that click your mouse buttons automatically at preset intervals. 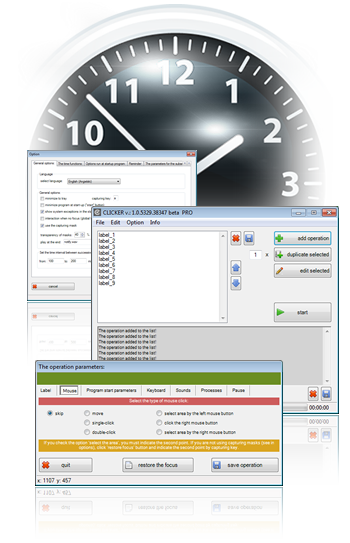 Free Mouse Auto Clicker is a simple utility that single-clicks or double-clicks your right or left mouse button at intervals ranging from hours to fractions of a second. It runs unobtrusively, with a System Tray icon you can click to call it up. It also starts and stops hotkeys. Integration with smsapi.com / smsapi.pl. Clicker can sending SMS messages now. Clicker can sending e-mail messages now. Clicker can sending newsletters by e-mail or sms messages. Clicker generate random time between actions/operation and between cycles (list of actions) from defined range of milliseconds. support for random position of mouse action (by setting the range). To use this feature use process named: ModifyMousePosition-RandomFromRange:x1;y1;x2;y2 or ModifyMousePosition-RandomFromSelectedPositionTo:width;height while you adding new action in processes tab (in pre-defined processes combobox). Working with mouse action like 'move' or 'singleClick'. We guarantee ... compared to competitive or similar software ... that this app is free of spyware or any virus code. Clicker doesn't keep the data in the registry (not spamming, working without using registry entries, config data are stored in .ini file). No installation required. Download the free version CLICKER with limitations. See donation page for details. WARNING: application requires Microsoft .Net Framework 2.0.